Last of the days light on the crags. The ferry slid in the port of Pothia with a full moon riding high in the sky. A million starry reflections bounced off the waves around us lighting the massive banner hung on the side of the port building proclaiming that the North Face climbing festival coincided this year with our bi-annual pilgrimage to clip some bolts under the Aegean sunshine. Our biggest concern was that the crags would be stuffed with folk there for the festival, to counter this Choire had downloaded the new Kalymnos climing guide app which was updated with all the new crags and routes, giving us plenty to choose from and hopefully get away from the crowds. This is a great bit of kit, no longer need you buy a guide book every few years or so to ensure you are abreast of the latest developments, £4.99 ( the proceeds of which go to the local bolt fund ) to download the app which is updated regularly. Only problems with it is that it does not tell you how long the routes are and how many bolts are on each route. ( Sort this out and you have a perfect companion to your climbing trip). Aegean textures on the hillside. We were not there for the climbing festival, in fact the idea of sitting in a Q and A session with the good and the great of climbing does not really appeal at all. 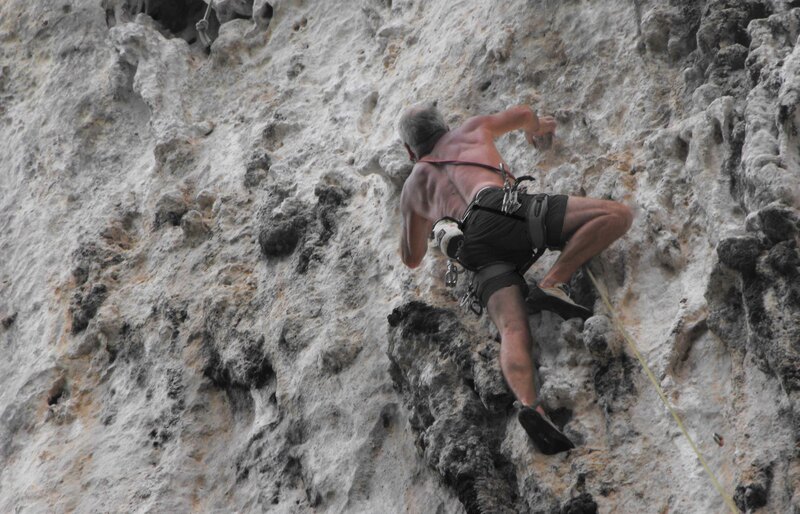 I know I should train harder, eat a better diet and climb more to be a better/harder climber but I am happy with a balanced life style and do not really aspire to be a rock athlete ( bit old now anyway ). 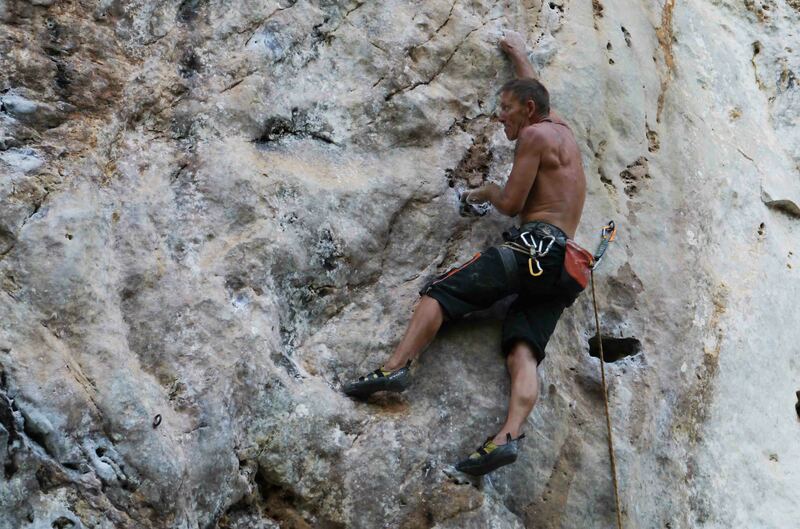 The festival is designed ( my belief is anyway) to raise the profile of climbing and also to help the economy of Kalymnos. In my opinion I do not think they could have got it more wrong. There is an area developed for the rock athletes to climb really hard routes and show off their skills, this year the area was so far away from the climbing center that the only way to get to it was a two hour walk or a chartered boat trip. The event was sponsored by Jeep ( amongst others ) and there was a daily procession of liveried monsters trying to thread their way through the narrow streets, doing what I have no idea and bringing what ( except vehicles for the organizers to play around in ) to climbing I have no idea. The majority of climbers I heard talking about it did nothing but complain about how it had impacted upon their climbing trip. 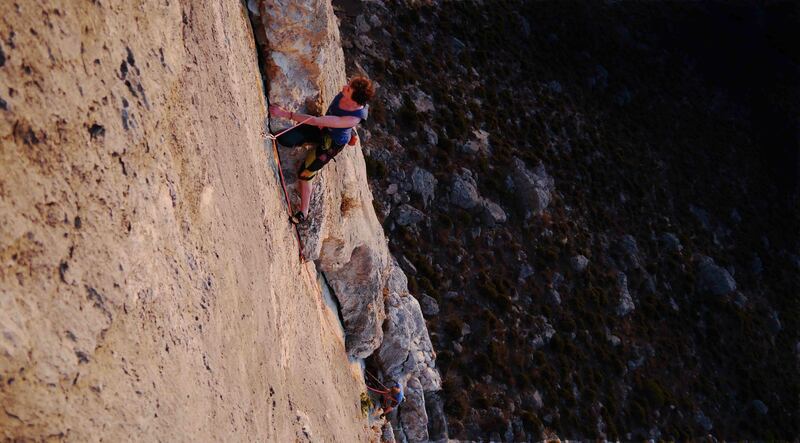 On pitch 4 of wildcountry, the multi pitch route on Telendos. However with our new “app” ( Makes me feel trendy saying that ) we discovered the delights of many crags that are not in the current guide. Little Verdon and ET, long walk ins and some dubious grades but both well worth a visit, Miltiades on Telendos, sharp rock but enough to keep the low/mid grade climber happy for a day or two. We also went back ( after the festival had finished ) to some of the more popular crags where I was really disappointed to see how dirty they were becoming. Toilet paper and excrement has become common just 25/30m away from the climbing area. Its really disappointing but this is just symptomatic of people who climb as a holiday pastime and have no respect for the island and the environment. Does the festival do anything to promote better behavior, no, not that I saw, it just concentrated on corporate identity, and produced some really dubious behavior, oh but it did throw a party on the beach and let off lots of fireworks which woke me up. Phil climbing on after the sun has set. The island has promoted itself as a family climbing destination so you have kids running up and down the bottom of the crags, stepping on your ropes, scrabbling up 7A’s on top ropes put up by totally stupid parents and groups of disinterested teenagers dragged along by their parent, sitting at the bottom of the crags, playing on phones just waiting to get creamed by a rock. Hmmmmmmmm. Hey maybe I am just a killjoy but all this stuff is never what I associated climbing with, in fact it’s the very opposite. However all this aside we had a great time with some great people climbing some great routes. One of which was a monster 9 pitch route on Telendos south face. I will go back but will pick my dates a little bit more carefully next time. Stramash… a gathering of like minded people usually in the company of alcohol and generally resulting in lively behaviour. If a motorbike, expensive road bike or a sports car is a sure sign of a ( generally male) mid-life crisis then a motorhome must be a sure sign of a late life crisis. Generalisation of course but the sunny weather seems to bring out octogenarians driving along roads that should ( by any sensibly minded person ) avoided in these things, especially given that said individual seems to lack any kind of sense of spatial awareness. One hour to travel the distance ( 10 miles?) between Bedgellert and the Roman camp stuck behind one of these bloody things, angry does not come close. That was on the way home after four brilliant days in superb weather climbing in Snowdonia with the Scottish contingent. Thursday afternoon Choire and I arrived at the CC Hut in the pass, stuck up tents and went to sleep in the sun awaiting the arrival of the Swintons ( senior and junior) and Mr Cunningham, my climbing buddy of too many years to mention. They arrived, we went straight to the crags, no point in hanging around I dare say. Over to Carreg Wasted where we ticked a fair old selection of what the crag had to offer in the way of warm ups ( Crackstone Rib, Shadow Wall, Yellow crack and Old Holbourne ). I retreated after only one route to prepare our meal for the following day giving us optimum time to spend on the crag. 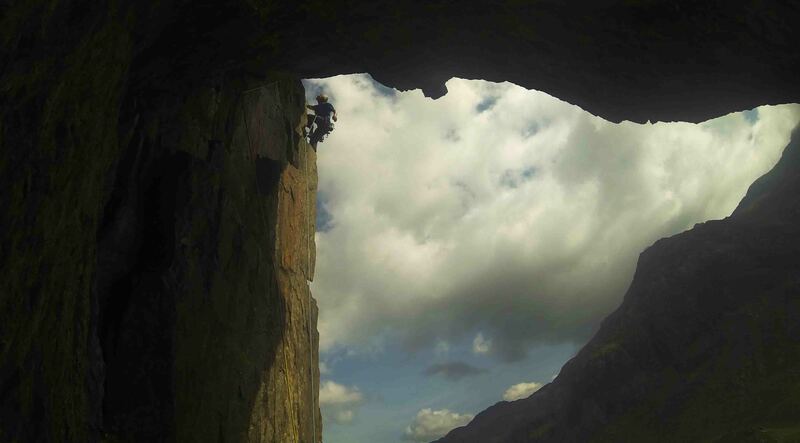 Gav climbs out of roof on the second pitch of Yellow crack. Next morning I sat in the early morning campsite and watched a Ring Ousel foraging on the dewy grass, hardy a breath of wind, already warm by 0900 we were on the Cromlech for our first big day of cragging. What a day, Dives/Better things, Curfew/Sabre Cut, Curfew, Resurrection, Cenotaph Corner, Grim Jim/Cemetery Gates. Rab managed a massive lob ( 7m or so) on Cemetery gates giving us all a bit of a surprise ( and himself one as well I dare say ) The day just went on and on whilst the cars and punters came and went up and down the pass way below us, generally completely unaware to the goings on above them. Ali managed to tick Resurrection but was frustrated by the lowering light and temperatures in his attempt to get on right wall. Gav managed to get sunburnt, we all managed to have a great day out and retire to the hut for the mega bean stew and a bottle of wine and then hit the tents to sleep the sleep that only such a day can produce. When Gav had arrived the previous day, when asked what he wanted to do his reply was “I want to go to Cloggy”, none of this “How do you fancy a day at Cloggy Chris ?” or ” I would really like to have a day out at Cloggy if you are up for it ” no just “I wanna go to Cloggy” I could see there was little point in offering up any alternatives so guess where we went the next day. Now for the uninitiated readers Clogwyn Du’r Arddu is a massive western facing cliff that can be seen from the Llanberris tourist path to the summit of Snowdon. It is one of the most steeped in history mountain crags of the UK, the scene of early goings on in takkity boots with hemp ropes as the great and good forged bold and intimidating routes on wet and dripping routes with laughable ( by modern standards ) gear. On a good day it is a cold and brooding environment that strikes fear into those attempting to find a way up and through its layers of dark and generally wet overlapping slabs and walls. Today was midsummers day and a scorcher at that so we took fleeces and wooly hats, long trousers and gloves and set off early early to get ahead of the others who would be doing the same. By 0930 Gav and Ally had set off up Vember and Rab and myself had started organising ourselves at the start to Great/Bow slab, a route which Rab had long aspired to tick. The day progressed, the line of climbers waiting for their chosen routes grew as we progressed further and further up the route. The noise from the line of sweating and red faced punters on the tourist track vied with the chuffing and huffing of the Snowdon train as it lifted its lazy cargo to the top of the hill. Its a real shame in my humble that the experience of being in such a magnificent place was spoilt by the impact of so many punters wanting a slice of the hill, an undoubted reality of living in such an overpopulated country. We ticked the route walked down and around and sat in the late afternoon sun for a while before joining the sun burnt limping and wobbling line of humanity making their way back to Llanberis after their own chosen challenge. Eyeing up the completely unprotected traverse ( and crux ) of the Great/Bow slab link up. Gav and Ally had finished with Vember, gone onto Great Slab and then finished the day in style on The Shrike, electing to do the whole Cloggy experience but missing last orders for food in the pub into the bargain, unlucky lads. Last day dawned warm and still, we had to be back home that evening so decided to go to Tremadog, why? to hurt our already bruised feet more by squeezing them into tight rock shoes and then struggling up some steep rock in 26 degrees of heat. And that was that, four days of brilliant crack and climbing in a fabulous environment with good company. So longstanding friendships further cemented through adversity with a common enemy we split up and went our separate ways to opposite ends of the country. Till the next time lads. 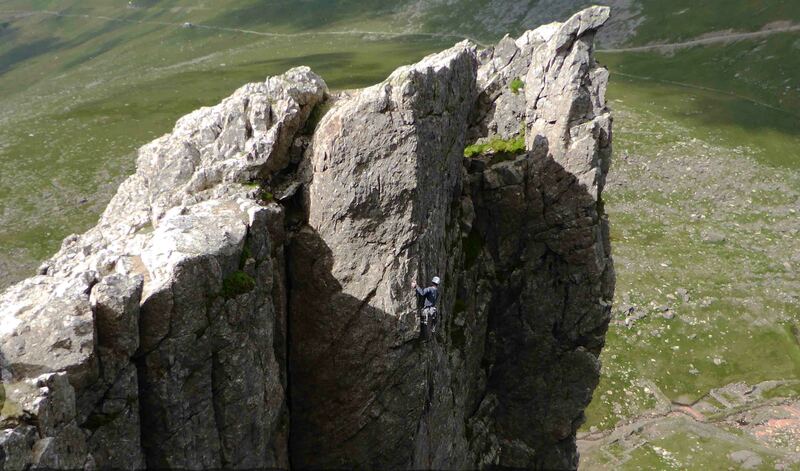 Choire tackles the unlikely looking ground of Space at Blockhouse buttress. 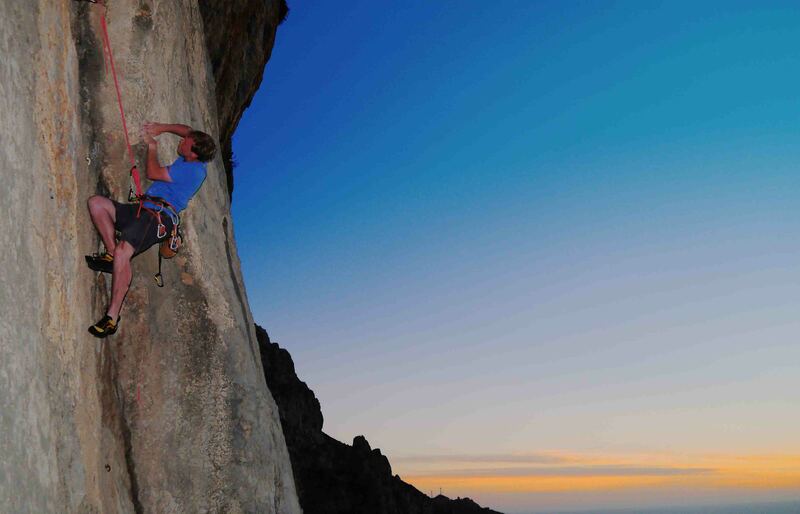 BOOM, Summer is here, blue skies, warm sunshine, light winds, its climbing time again. 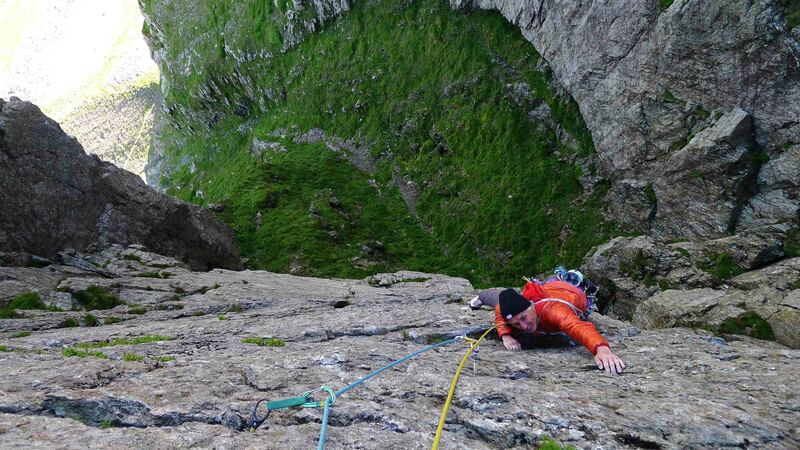 Well at least for the time being and where better to kick off the season than at Pemroke and where better to go for the first days climbing than Mother Careys of course, a real baptism of fire. 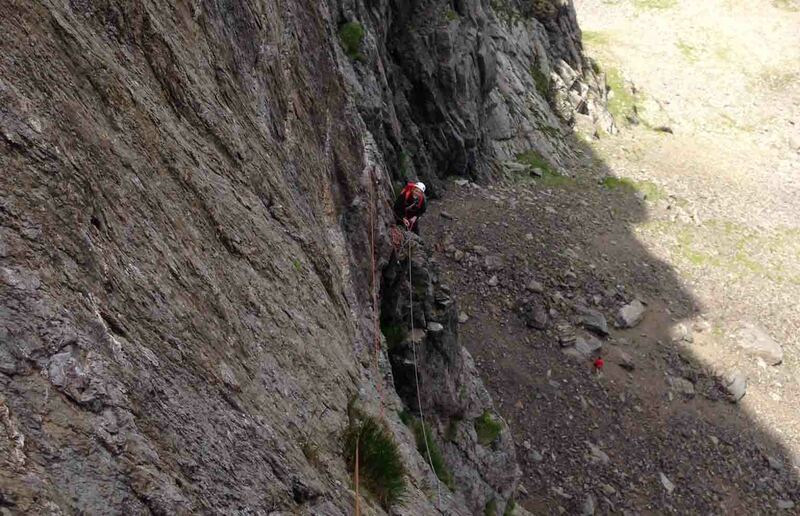 There are much easier crags to start the season with but hey, in for a penny. Sooooo Choire and I headed down to the crag, abbed in and went straight to Rock Idol, a mega E1 put up by Pat Littlejohn many years ago. 45m of fairly sustained vertical rock with the occasional overhangs had me sweating and cursing for choosing it as a warm up. Its given the accolade of being one of the best E1’s in the UK, not sure about this but its certainly up there. Choire then went on to make Herod, another good E1, look easy and we finished the day with a supposed ascent of a lovely VS called Meridian ( which we later found out was a bit of an amalgamation as we didn’t have a guide book ) which was really really nice. Then it was over to Neylands to see Mr Climb Pembroke, Henry Castle ( aka Noggin ). A great evening was spent sorting out all the issues that seem to flummox our politicians and climbing friends ( if only these guys could be with us when we have had a couple glasses of wine ) and next morning after a reasonably leisurely start we made full use of the armies temporary cessation of hostilities for the Easter holidays at Range East. The majority of climbers are like most people, they do not like to walk overly far from the security of their car and tend to stick to the crags nearest to the car parks and lets face it with there being so much great rock at Pembroke you do not suffer for having this attitude. However walk for another 500m or so and you have crag after crag of brilliant climbing that no-one else seems to care about. so Blockhouse buttress chosen we set up an abb and launched ourselves in to the unknown and a journey of discovery ( well for us anyway ). Down at the big wave washed slabs at the bottom of the cliffs we were in a lovely remote world of our own. the Kittiwakes Kittywaked and the Choughs plummeted and swooped around the hugh expanses of rock all around us. 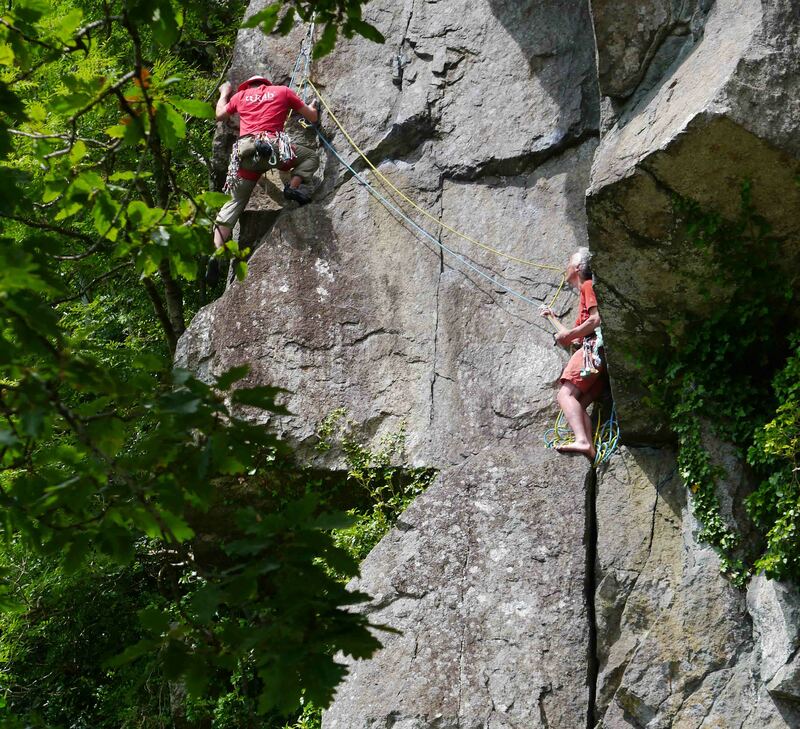 We did another three routes ( well Henry and Choire did ) a two pitch hard severe called sheer delight, which actually was, a two pitch E1 called unreasonable stipulation and then Henry and Choire set off for the real reason for us being there, a route called Space. I opted to sit it out on the cliff top and wield the camera. 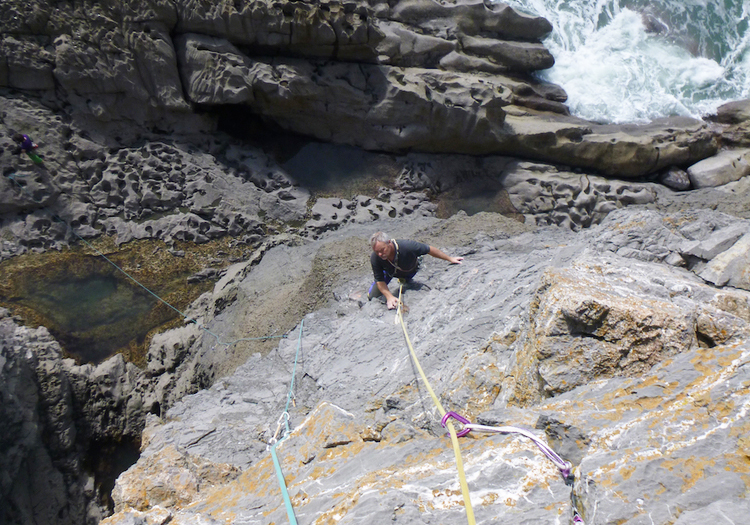 I chuckled as I watched them getting soaked by the rising tide as they made their way around to the start of the route then held my breath as I watched Choire make his way through the series of overhangs running the two pitches together into one mega jug fest. A brilliant day out, and guess what, we never saw another soul all day. Jane climbs Buzzsaw at Spirit Mountain. Driving along the M3 early doors on the 12th January the trees and the grass were like a fine lace filigree on either side of the empty motorway. For the first time this year Jack had been at work and was displaying his handicraft against a lovely blue sky. The weather for the last few weeks had been foul – amber, yellow and red weather warnings. The weather men had been unanimous in being pusillanimous: incessant wind and rain and flood and storm damage warnings; some folk were even starting to blame the rising sea temperatures – reality sinking in!?! We had made a conscious decision to remain in the UK for Xmas this year. Never again: December had been more like a climatic battle ground than a pre Xmas month. One of the New Routes at Spirit Mountain. Heathrow was, well Heathrow. What is it about airports that brings out the worst in people? – jumping queues, being argumentative and if there is one thing about airports that does wind me up it’s people with luggage on wheels. These things are pulled along by folk who seem to have absolutely no spacial awareness and are more than likely to be busy texting or talking on their phones whilst taking up the whole walkway or pulling the things over your feet, unaware that the big suitcase or even worse suitcases do not follow exactly the same route as they do whilst going round corners. They are the motorway equivalent of BMW X5 drivers. We flew direct to Bangkok and then onto Krabi with Royal Thai airlines 16 hrs door to door – a brilliant decision, as last time we spent 7 hours in Abu Dhabi, then over nighted in Bangkok, before catching the internal flight. This option was cheaper but the cost of an overnight in BKK and the mental stress of a 48 hour journey made the increased cost of a direct flight a no brainer. Fact I think it almost worked out the same in the end and Royal Thai are brilliant. 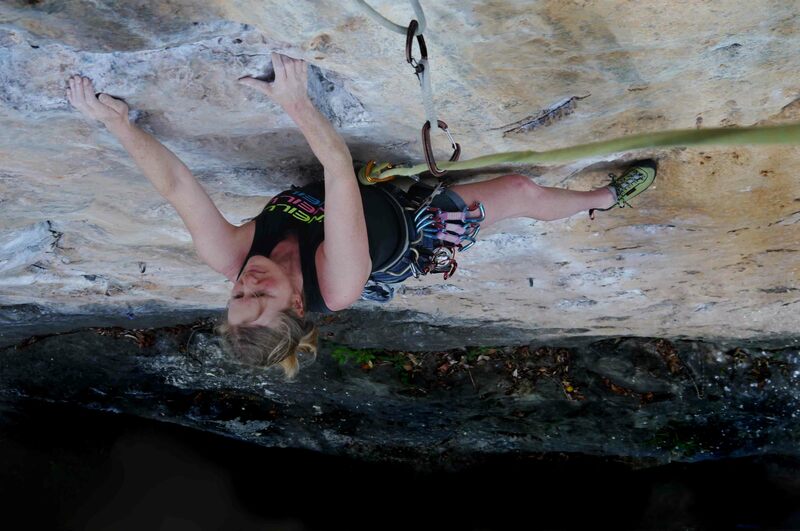 This was our second time in Thailand in just over 12 months, ostensibly to climb (which is why this is posted in the climbing section) but really just to escape the crap UK weather in Jan/Feb. 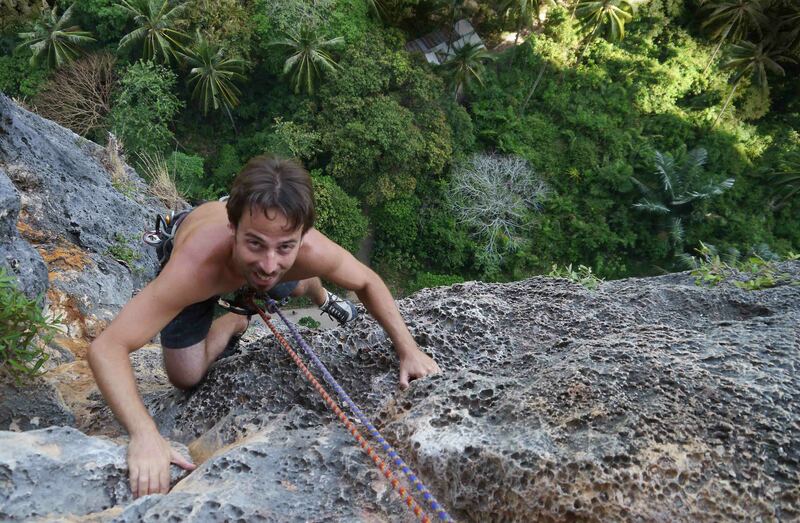 Thailand for me is not a great climbing destination. Do not get me wrong here there is loads of great climbing to be had, but there is far more to the country than limestone cliffs, bolts and tufas. There is the culture; the people and the history here is fantastic; The food is probably the best in the world and there are the beaches, if you get away from the resorts and the crowds, which is easy if you make the effort, and there is the scenery which is hard to beat for sheer outlandishness. View of the Karsts from Koh Yao Noi. Mile upon mile of Karsts which look like they are made out of melting limestone dripping with dense jungle found either sticking out of the water or the land looking more like a Roger Dean painting than a Roger Dean painting. Truth is it’s a wee bit too hot and humid for us Europeans to give the climbing really big licks as you get very sweaty and tired out quickly. The routes are generally a bit polished unless you get off of the beaten track and some are worryingly bolted and have in situ tat that seems to have been there for a few years. Also what climbing there is is grouped together into areas that make visiting other areas in the constraints of a two week trip quite demanding. No problem for us though as we were there for four weeks. So it is with this in mind that we set out to enjoy all the aspects of this amazing country, and do a bit of climbing to boot. First thing (after you have got there and found accommodation) is transport. Although there is a myriad of public transport there is nothing like the freedom of having your own wheels, and in there lies the biggest issue. 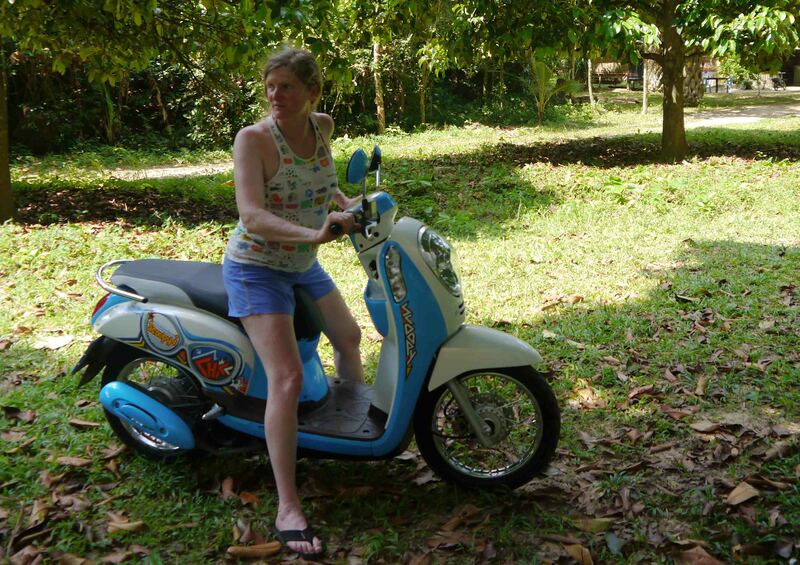 Thailand is, so I am told, statistically the most dangerous country in the world in which to drive. Like most Asian countries the two wheeled option is king – everyone drives Scooters and they are used for everything. I have seen kids as young as seven at the controls, driving licence? nah! You got the money and a passport (if you are a tourist) you can have one, what’s more you can have one each for all the family on the one document. Insurance? Not if you do not want to pay for it. Missing out bolts and making exposure at Spirit Mountain even more exposed. So, you have kids, teenage girls and boys, workmen, businessmen, women doing their shopping, taking the kids to school etc etc all driving about on bikes. Then add into the mix the number of people you can get onto one of these things, the record I have seen is seven, an entire family and that was counting the dog. The young lads tend to drive with testosterone fuelled insanity sometimes racing each other through the crush of traffic, the teenage girls will suddenly stop or cross the road if they see a friend or something in one of the shops, with absolutely no awareness of anything else happening around them. The workmen carry 3m pipes, planks, sharpened bamboo stakes, gas bottles etc on their shoulders whilst driving; the women tend to have a bit more sense, everyone will drive whilst talking or texting on their phones or smoking a fag or drinking a coffee. Leif eyes up the next move on Scorpion. If that is not enough there is a complete lack, or complete disregard for of any real rules of the road, you are supposed to drive on the left but this is widely disregarded. Junctions are beyond my ability to see any real rules of engagement – I just waited for a clear space and hoped nothing decided to ram me. You do not pull over to the middle of the road if turning right, you cross early and drive up the wrong side till you get there. You do not give way to oncoming traffic, you pull out regardless and hope nothing hits you. Driving down through town you are watching what is happening up ahead to ensure nothing is about to pull out, reverse out, step out, stop abruptly in front of you whilst watching your mirrors to ensure nothing is about to undertake, overtake, ram you from behind It’s crazy! Now finally add into all of this bikes with a cage bolted onto the side to carry freight (up to one metric ton of liquid powered by a 50cc, or passengers (tuk tuks), cars, taxis, lorries, buses, pick ups and cement mixers all to whom the bikes are an annoyance that should be bullied out of the way and finally tourists on bikes who decide that the ability to drive fast in all of this is some kind of way of demonstrating your mastery of Thailand. It is no surprise therefore that as you drive down Ao Nang road there are the outlines of accident casualties painted onto the road every 10m or so. Thought climbing was scary ? We based ourselves in Ao Nang again, mainly to avoid getting sick with Tonsai tummy (the majority of folk who stay there seem to get struck down for two or three days) and also to give us the ability to visit lots of different areas on our groovy bike. Spirit Mountain, a local crag became our local and being away from Railay meant it was quieter and less crowded. There is not a hugh number of routes there but there are some good projects to work at. We also had a few days over at Tonsai (Eagle Wall, Melting Wall) and Railay (The Keep, Wee’s Pesent Wall and Thaiwand Wall) and Jan and I ticked a route called the Big Wave, one of the longest routes in the area, never hard but always interesting. 6A+, 6B, 6B, 6B, 6B. Jan tops out on the penultimate pitch of the Big Wave, the jungle of Tonsai way below. Two days on and one day off is just about as much as I can take and generally the days are quite short starting early and finishing before it gets too hot or you get too dehydrated. This then leaves you free to go and enjoy the beaches. I am not a massive beach person but when in Rome… The beach front at Ao Nang is your usual tourist spot, the water has a sheen of Suntan cream on it and the aroma of Piz Buin is overpowering. There is a constant cacophony of noise as the long tailed boats come and go and you cannot walk in a straight line for puffy white, pink, red or really brown flesh stacked together like multicoloured elephant seals on a South American shore. However a short 20 minute bike ride will take you out to beaches where there is far more poundage of fiddler crabs p/sq/m than humans. Jane on what became, our beach, other people not welcome. Yet hardly anyone makes the effort, maybe its my misanthropic streak but I just do not get it, peace, tranquility and a warm sea to myself to swim in. I should be glad I guess. I enjoy this part of a Thailand trip, walking along the beach on a rest day or after a hard session on the crags, the crabs running like ball bearings out of your way as you wander listening to the cicadas howling from the trees lining the shore. Awesome. Fiddler Crab squaring up for a fight. We also made the effort to head up to an Island called Koh Yao Noi for a few days, a 40 min bike (take your life in your hands (or someone elses)) ride, then a 40 min boat trip with bike. The Island sits between the fleshpots (and thats putting it mildly) of the Phuket island, sort off island, it’s joined by a bridge (The Thai Benidorm) and the mainland (or main peninsula) but although it does get touristed it is nothing like Ao Nang, it’s sleepy by comparison and a brilliant place to relax and unwind. 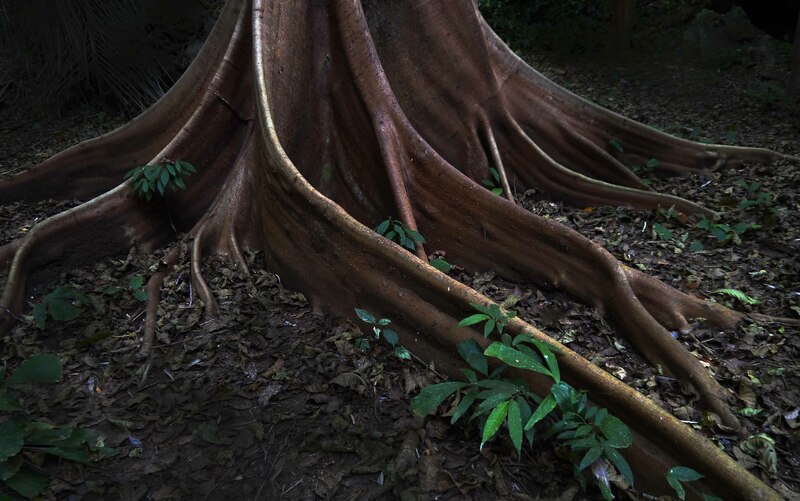 The climbing areas on the island are a bit difficult to get to, a 30min ride on a very rough dirt track through the rubber tree plantations, which leaves your spine bruised and your backside red raw, then a hot and humid sweat through the jungle on quite steep paths to the crags. There is not a whole load of stuff there, maybe enough to keep you busy for a week or so of concentrated effort but it is quality, even if the bolts have not all been replaced by Titanium ones yet. 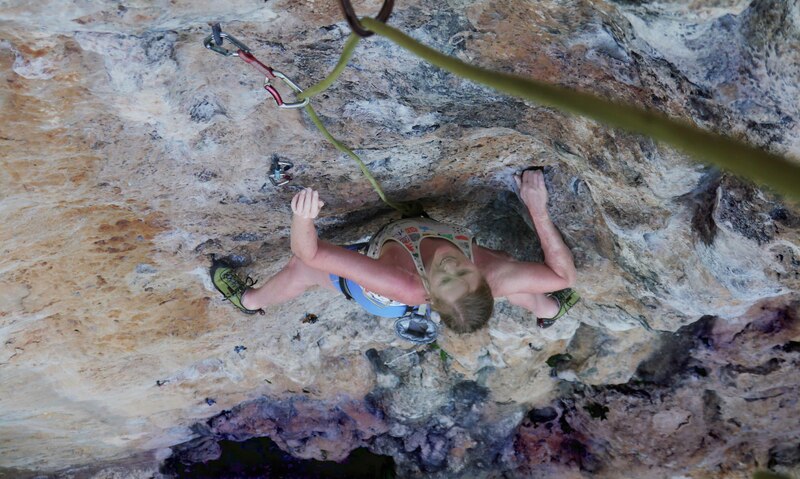 I would go as far to say that I did the most outrageous 6B ever in my life at a crag called the Mitt – three dimensional climbing at its best and so over hanging that you need a mid point belay (provided) to retrieve your gear. 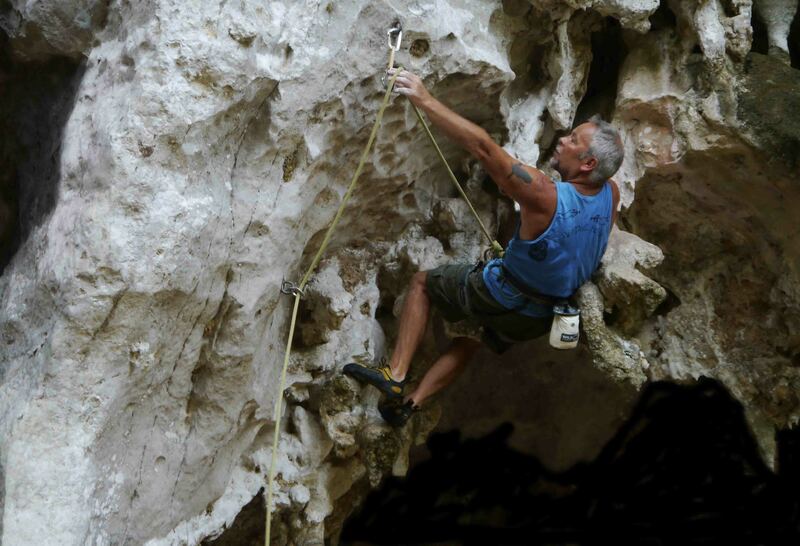 What is also great about the climbing areas on Koh Yao Noi are the surroundings: hornbills flap about in the trees, BIG monitor lizards scuttle away from you as you make your way along the trails – you really feel you are in the jungle and away from it all. There are of course many other places to climb here and many other aspects of Thailand which I have not written about, the food for example, and you do not have to keep your loo roll in the fridge, maybe next trip. However one of the highlights for me was watching some folk newly arrived off the boat at Railay trying to pull their suitcases on wheels through the sand – revenge – brilliant!! Made my day. Great write up Chris and some fantastic photos. I hope your ready for the weather back home! No Henry I am not ready to face it yet, I am hiding in front of the wood burner with the curtains closed. Good trip tho, really enjoyable and some nice relaxed climbing.